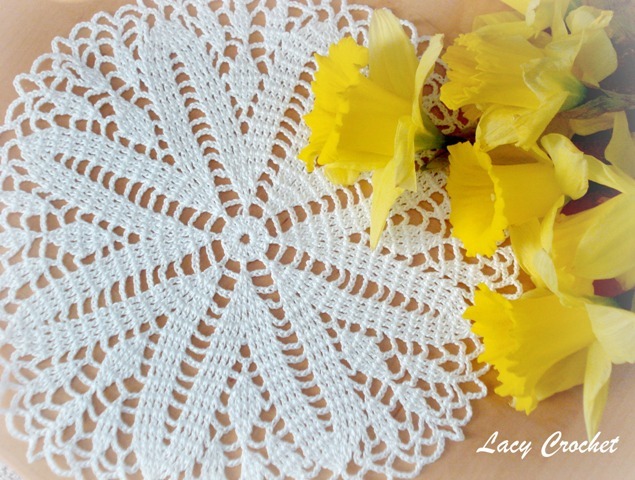 The doily that I’m sharing today is a special one. This is not the doily one would keep on display year round. Rather it’s a doily to be pulled out and used for a very special occasion – Valentine’s Day! Perhaps the pattern itself doesn’t have much in common with romance, but its rich red color certainly does. And to show it, I set up this romantic vignette. 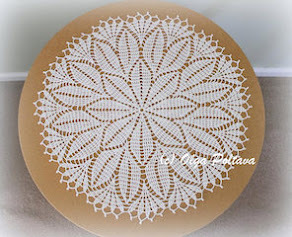 I finished this doily just a few days ago. 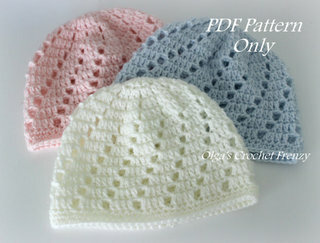 The pattern is from French crochet magazine 1000 Mailles Crochet Givre Le Crochet Facile #52. 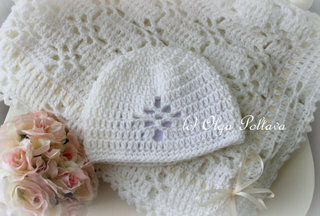 I used pearl cotton thread. I recently signed up for a bookmark exchange, and this is the bookmark I made for my exchange partner. 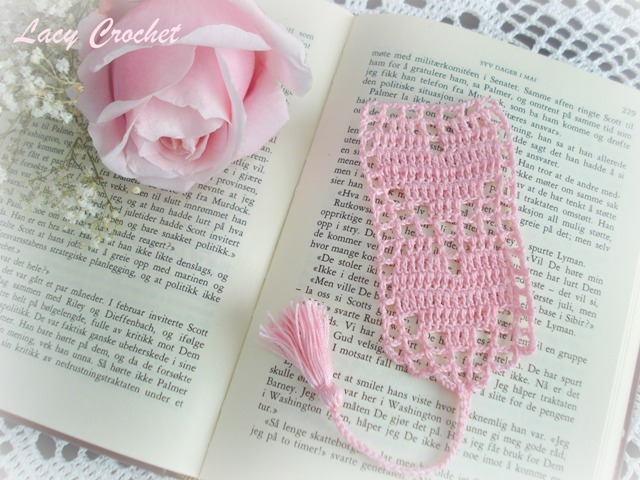 If you follow my blog, you probably know that about two weeks ago, I crocheted a heart bookmark using pink thread. I didn’t feel like making another thread bookmark, so I decided to experiment with thin yarn. 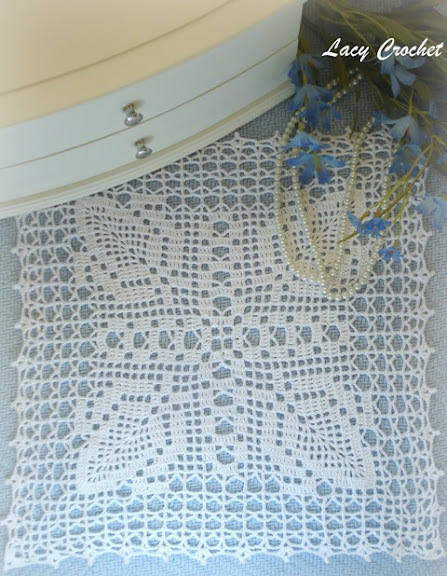 I found the pattern on Crochetroo blog (click and scroll down for American instructions). What’s great about this pattern is that the author has it in several different languages. 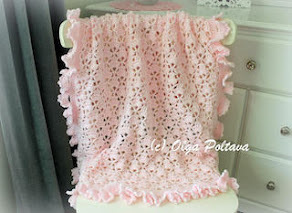 The blog itself wasn’t updated since last summer, but it has many interesting crochet projects and patterns in its archive. I am very satisfied with the way my bookmark turned out. I only need to buy spray starch to stiffen it a bit, and it will be ready to be mailed to its recipient. 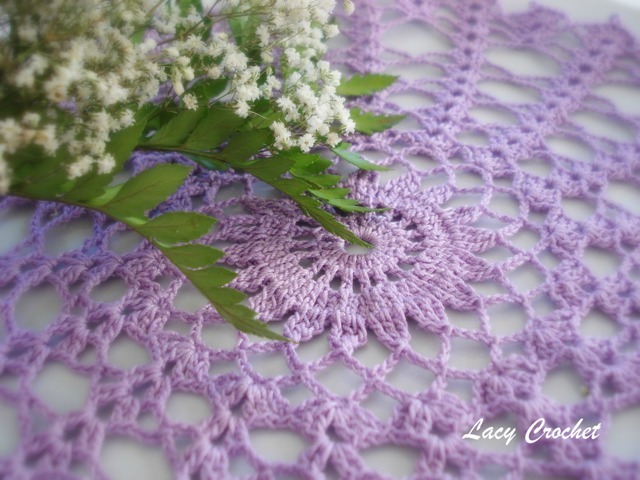 I made this doily some time ago, and I don’t remember now where I got the pattern from. 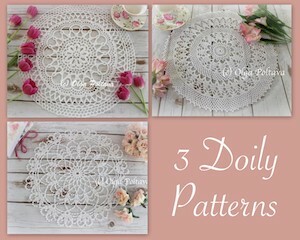 I liked the clear lines of the flower in the doily design. It’s cold and rainy outside, so I wanted to post something cheerful today. The yellow narcissus flowers in the picture brighten this gloomy morning. 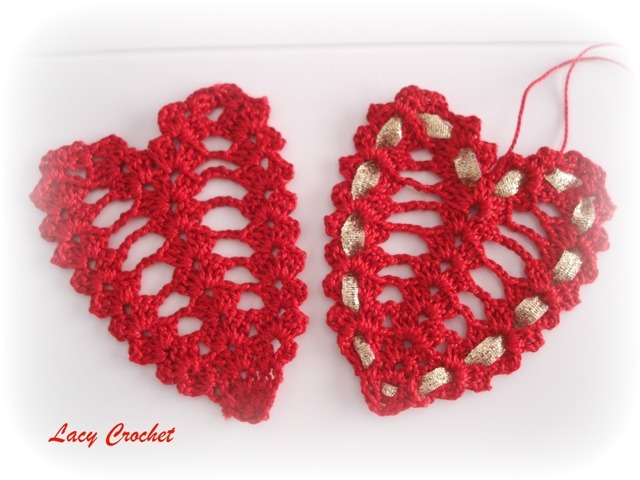 Back in December in the post titled “Last Christmas Ornament of the Year”, I shared a picture of a small crochet heart that I made. I didn’t have the pattern sketched back then, but I promised my readers to share it before Valentine’s Day. I loved my little ornament even more in red (and I now contemplate trying it in pink). I used pearl cotton thread, and the heart came out about 3 inches tall and 2.75 inches wide. The finished heart itself was quite simple, but adding a ribbon made a lovely detail and helped shape the heart a bit. The symbol chart I sketched is shown below. I gladly share it with anyone who would like to try crocheting this ornament. 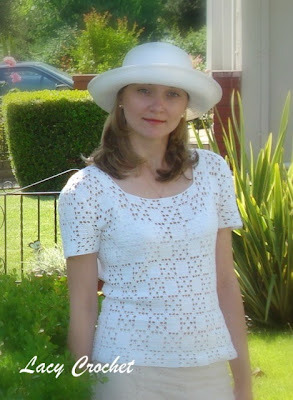 I want to cordially thank Kim from SymbolCrochet Yahoo group for testing my pattern and making valuable suggestions. Thank you, Kim! 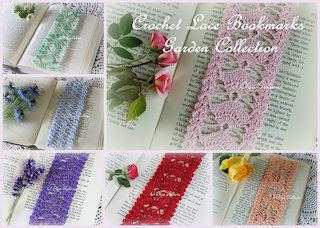 Link Your Stuff @ Annemarie's Crochet Blog. 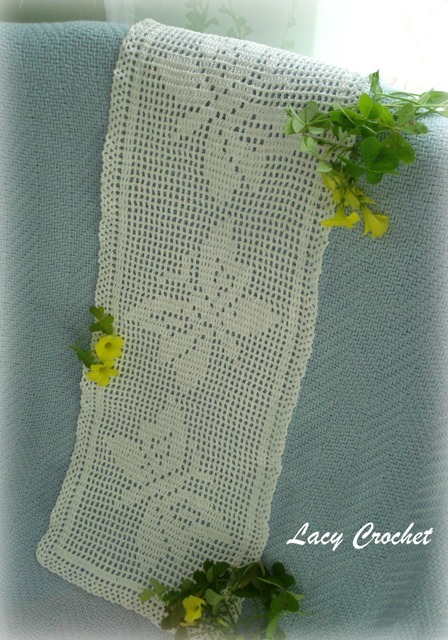 This rectangular doily with butterflies was the first filet crochet project that I tried. It was a bit tedious counting the meshes, but I think the result is well worth it. 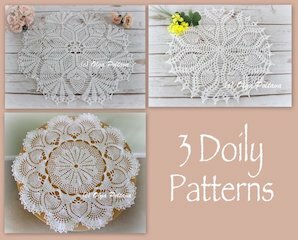 I want to try making more doilies with this technique and perhaps even designing a few of my own. 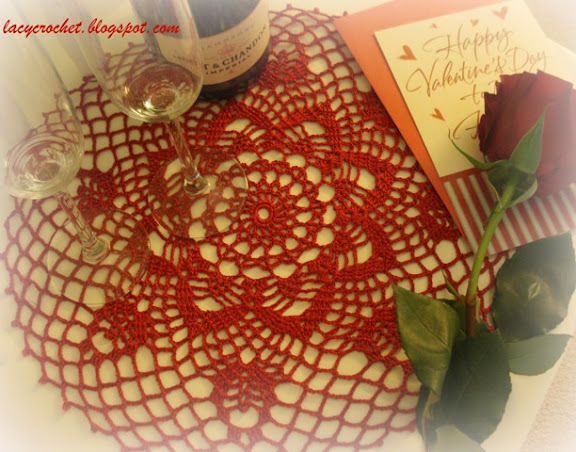 The Holiday Season is behind us, but now there is Valentine's Day to look forward to. I enjoy the anticipation of it more than the holiday itself. For me, the best part is making little gifts and trinkets for friends and family. 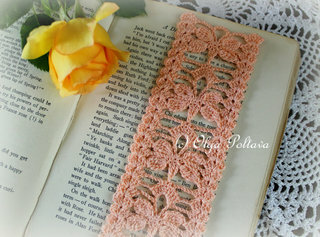 This little heart bookmark is for a friend who enjoys reading. I found the pattern at Free Craft Unlimited. 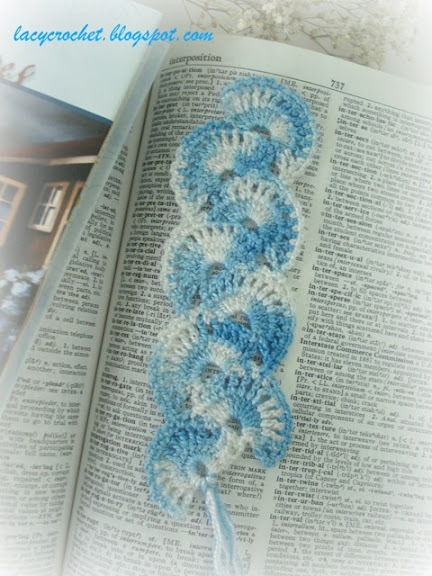 There is a little personal accomplishment associated with this bookmark pattern. It is the first written instructions pattern that I was able to complete! English is not my native language, so until now written patterns in English didn’t make any sense to me (I prefer symbol charts). But now, little by little, they become more comprehensible. 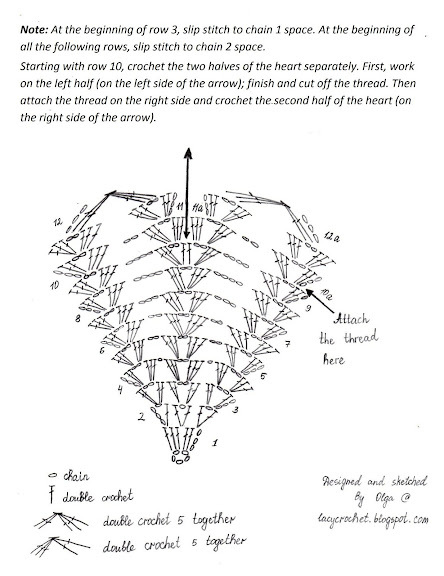 If I study hard enough, perhaps one day I will be able to write instructions for my own patterns. That would be great! 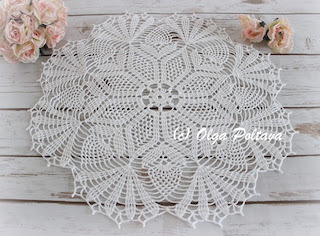 The size of this doily is twelve by twelve inches (about 30 by 30 cm). I used size 10 crochet thread. 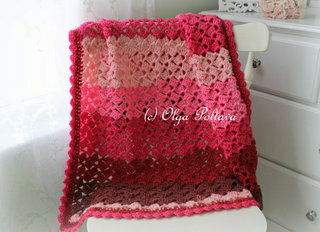 The pattern is from the French crochet magazine 1000 Mailles Crochet Givre Le Crochet Facile. 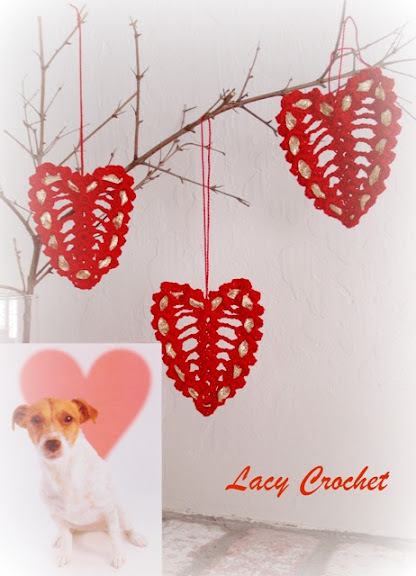 I don’t have any finished projects to share right now (although I’m working on several Valentine’s Day ones), so I went through my old photos to see what kind of crochet bits and pieces I can show today. Since I haven’t posted about crochet clothes yet, I thought a little parade of crochet tops could be inspiring. I start with this little pink tank-top. My mom crocheted it for me several years ago. She used some leftover pink thread in two slightly different shades. She was clever to alternate the two shades in stripes, creating an interesting effect. 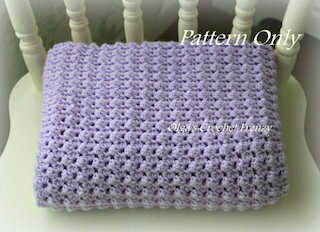 The pattern itself is extremely simple - just rows after rows of double crochets. This white top was also made by my mom. It’s lacy and romantic. Just the way I like it! 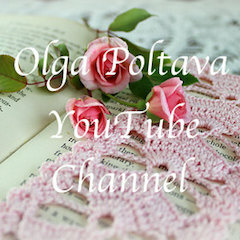 She used a pattern from some Russian crochet magazine. 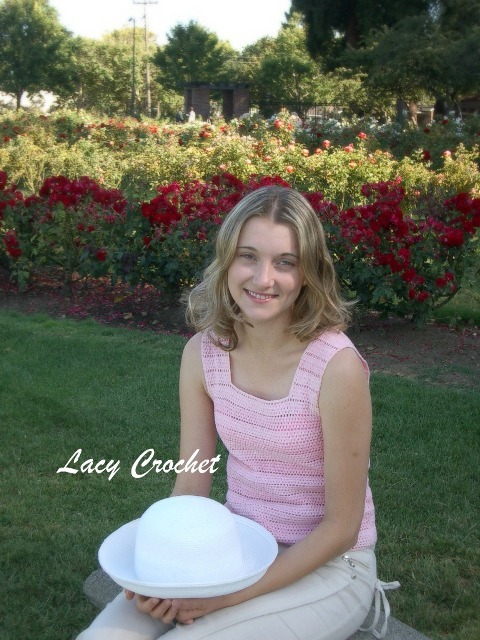 Yet another top crocheted by mom. 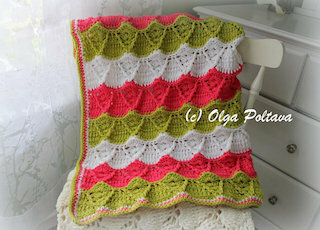 Again, the pattern was from a Russian crochet magazine. 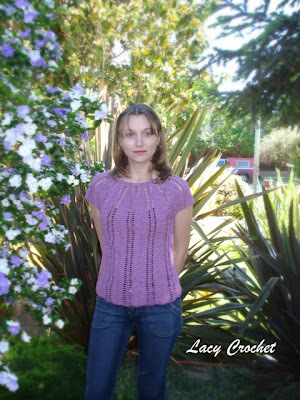 For the previous two tops, she used thread, but for this one she used yarn. The top is a bit too warm for summer, but I like wearing it in winter on top of a black turtleneck. Finally, a top that I made myself! The upper part of the top is knitted, but the bottom part is crocheted. I intended to make it longer, but I ran out of yarn and couldn’t buy the same brand anywhere. So it is the way it is. Do you crochet clothes? Do you own any handmade crochet pieces? 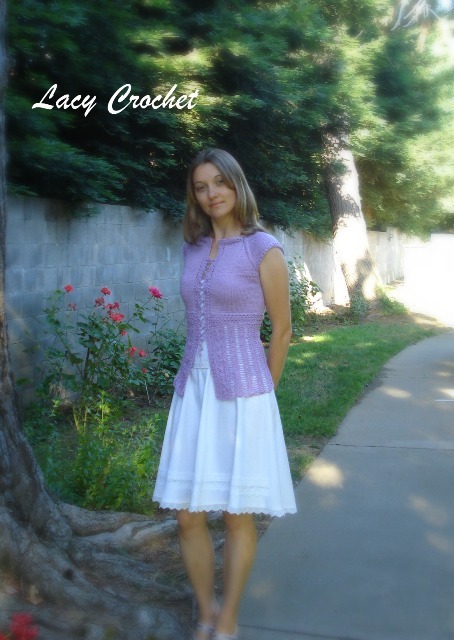 Crochet hats and scarves are always popular, but what about tops, sweaters, skirts, and other garments? 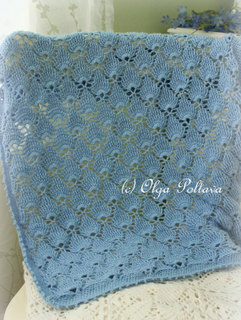 I'm linking to Fibers on Friday @ Visions of Sugar Plums. I thought today I will share with you the doily that is currently featured in my header. 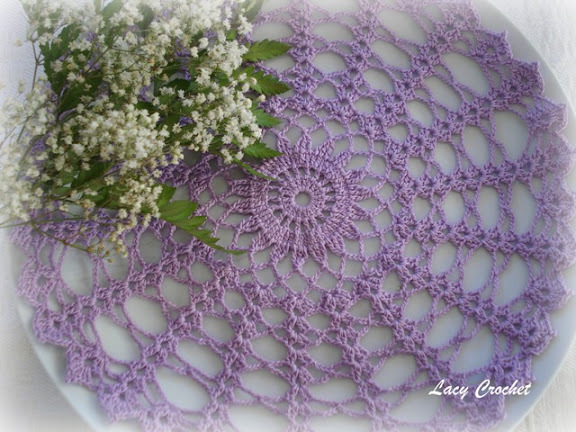 I crocheted this doily last year using the left over lilac thread. I didn't think it would turn out so lovely. 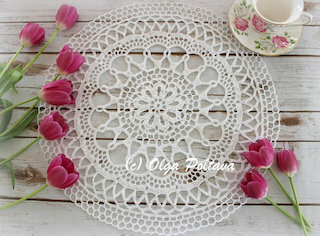 I don't have this doily anymore (I gave it away), but honestly I love looking at these pictures. I've taken so many pictures of my doilies in the past year, but these ones are my all-time favorite.